Candidates looking for UES 29th entry 2018 have a good news Indian army is looking for young engineering degree candidates of pre-final and final year engineering 2018 for Grant of Permanent Commission in the Army. Total 30 Vacancies for Pre-Final Year (PFY) BE/ B.Tech (PFY) candidates of various Engineering branch/stream should apply.candidates who are interested to join Indian army can read the full notification and apply online for UES 29th entry. Age Limit: Born between 02 Jan 93 and 01 Jan 99 – Not below 18 Yrs and not over 24 Yrs. Note: Age limit mentioned above will be applicable at the time of commencement of course. Matriculation Certificate issued by the Board concerned CBSE/ State Boards/ CSCE) in which date of birth is reflected will be accepted and no subsequent request for change in Date of Birth will be considered or granted. (Admit Card/Mark sheet/Transfer/Leaving Certificate etc are not acceptable). Educational Qualification: Candidates should be studying in the Pre-Final of the Engineering Course in the concerned Branch from recognized Universities/ Institution/ College. Selection Process: Candidates are selected based on Screening test, Psychological Tests, Group Testing, Interview and Medical Examination. (c) Candidates are required to be under graduates during the selection process and must be graduates at the time of commencement of the course. Candidates whose University examination pattern does not permit applying for the UES are advised to apply for TGC/SSC (T) commencing at IMA Dehradun/ OTA Chennai in Jan/Apr and Jul/Oct every year. TGC/ SSC (T) courses are being notified in Employment News and other prominent Newspapers in April and Oct i.e. approximately nine months before commencement of TGC course at IMA Dehradun and 12 months before commencement SSC(T)course at OTA Chennai. The decision of DG Recruiting, Army HQ in the matter of shortlisting and forwarding of applications to Selection Center for SSB interview will be final. (f) Candidates who qualify at the SSB and are found medically fit by a Medical Board will be placed in order of merit. The final selection will be made in the order up to the number of vacancies available at that time. (j) After successful completion of degree course the candidates finally selected will be admitted for Pre-Commission training at Indian Military Academy (IMA), Dehradun for a period of 12 months. How to Apply online: Eligible and interested candidates can can apply online from the website www.joinindianarmy.nic.in or follow the official link below for notification. 2. Click on Officers - How to Apply - Online Application- UES -29 Course. 3. Read the official notification carefully and click on Continue. 4. New candidates have to Register first by providing unique User Name and Password. 5. After registering login by clicking on Online Application Form for the Course. 6. Fill the details like Personal details, Communication, SSB, Educational details and save the details. 7.After filling the details click on save button and submit the details. 8. After submission, Roll No will be auto generated retain it for future use. 9.. Take printout of the PDF File and keep it safe for further use. Date of Interview: 2018 onwards. 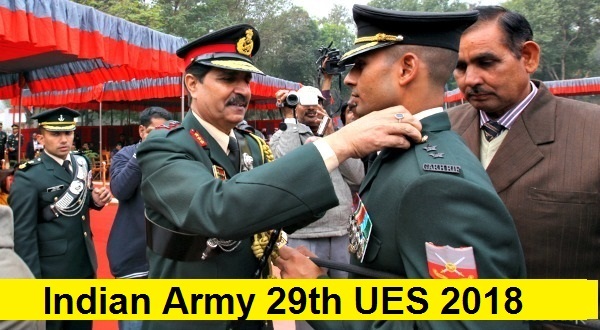 Candidates can fill the form and apply for UES 29th entries 2018 from the following steps mentioned above and also visit the official website and fill the application forms for the pre final engineering UES entries 2018 for more details regarding SSB read the below article for more details regarding the SSB can read the article for more information. Also candidates like us on Facebook or follow us on Google for more details regarding Indian army jobs 2018 or various entries in Indian armed forces.For any details regarding UES 29th entries 2018 comment below.